Take a bowl, add rice flour, castor sugar, oil, mix it properly and knead dough. Take a bowl, add khoya, coconut powder, castor sugar, almonds, pistachio and mix it well. 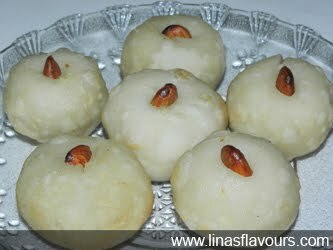 Make small balls from dough and make small puris with hands. Put the mixture in centre and fold from all the sides and make a ball. Press one almond in the centre. Prepare all the balls. Take a frying pan and heat ghee. Deep fry all the balls. If you like crispy taste then instead of castor sugar you can add sugar.